BOSTON, Mass., Oct. 25, 2012 (SEND2PRESS NEWSWIRE) — Localization LLC Translations is happy to announce its newest location in Boston, Massachusetts at One Boston Place (201 Washington Street, Suite 2600). This new location is the result of the expanding need for translation and language service in today’s challenging business market. Certified translation and transcription services, such as Localization LLC, have expanded as law firms, government agencies, and medical companies need both reliable and confidential service to approach the new international markets. Medical Translation and Interpreting services alone have grown 35 percent in the past year, as more and more local businesses realize the need for reaching a new audience. The new location of Localization LLC Translations will also incorporate several new language services to the Boston business community. The company will continue to offer certified translation and transcription services in over 50 languages, as well as consecutive and simultaneous interpreting in Spanish, French, Japanese, and Chinese. To introduce the company and its new services to Boston, Localization LLC Translations will be offering a 15 percent discount to new clients in the area, and will be meeting with local business leaders and government agencies over the next few months, helping introduce the idea of marketing, translation, interpreting and transcription, as well as continuing with linguistic research & development to solve some of the communication challenges faced by organizations and individuals in today’s global economy. Localization LLC Translations Boston is a full service translation company providing comprehensive translation, localization and multimedia services in over 50 languages. With offices in both Boston Massachusetts, and Cleveland, Ohio, Localization, LLC Translations continues to provide language services to our clients in Boston, Chicago, Washington D.C., San-Francisco, London, Mexico City and Paris to name a few. 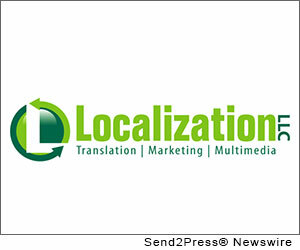 For more information about Localization LLC Translations, and its certified translation, transcription, and interpreting – visit http://www.localizationllc.com/ or call 617-671-0523. NEWS SOURCE: Localization LLC :: This press release was issued on behalf of the news source by Send2Press(R) Newswire, a service of Neotrope(R). View all current news at the Send2Press for Journalists Portal: http://Send2PressNewswire.com/ .